As India’s urbanization picks up speed, the traditionally-preferred property investment locations in most of the main cities are getting saturated and increasingly expensive. This is having a roll-on effect on many other residential sub-markets across leading Indian cities. Even as more and more locations go out of the reach of a certain cross-segment of buyers that preferred it in the preceding years, other emerging areas come to the rescue. Such sub-markets tend to offer a marked price advantage vis-à-vis the more established locations – and the residential projects coming up there are compliant with the latest development laws and tend to have more contemporary amenities. All these ‘pull factors’ lead to such locations seeing good sales traction independent of the rate at which sales are taking place at the city level. 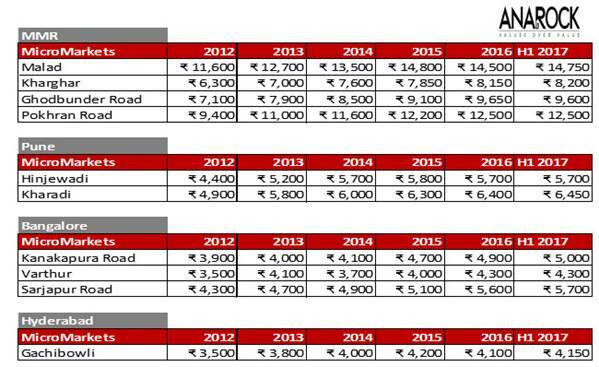 Malad is witnessing massive sales in the ‘compact homes’ category – which offers increased affordability within the city limits – and due to the area’s proximity to some of the suburban office districts, Kharghar is seeing higher sales due to a good supply of apartments at relatively lower entry prices when compared to some of the more established locations within Navi Mumbai. Good infrastructure, connectivity to prime office locations of Navi Mumbai and access to both Mumbai and Pune also favour Kharghar. Thane’s Ghodbunder Road has, for quite a few years now, been the hotbed of residential activity in this part of the Mum bai Metropolitan Region. While the further stretches of Ghodbunder Road offer good budget housing options to a large section of home buyers, other stretches offer ultra-luxurious projects along with an evolved social and physical infrastructure due to several years of development. Ghodbunder Road also offers very good connectivity to the extended Western suburbs on one side and the office corridors of Thane and Navi Mumbai on the other. This important transit route connects Ahmedabad highway on one end to Agra highway on the other. In Pune, Hinjewadi and Kharadi offer reasonably good affordability in proximity to the city’s major Infotech corridors. Both areas have witnessed a steady increase in the number of customer enquiries as developers come up with affordable as well as upper mid and high segment projects, coupled with enticing offers to lure customers. 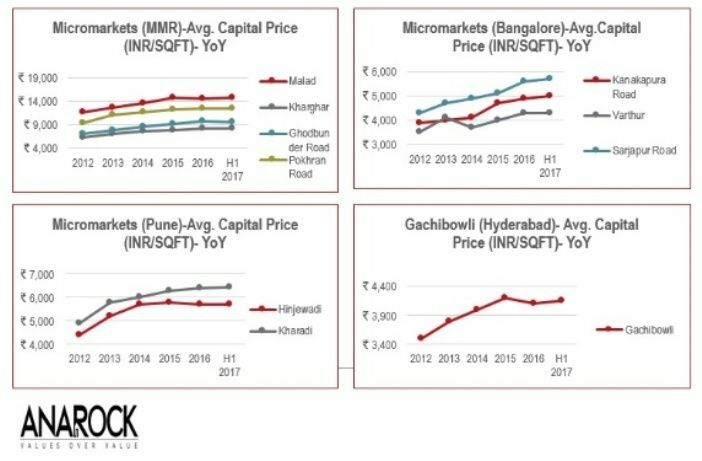 As more affordable and mid-segment housing projects enter the market, these locations will continue witnessing greater traction than many other areas of Pune in the years ahead. Kanakapura Road in the southern part of India’s IT city of Bangalore is known to be mid-segment buyers’ preferred destination, and is now witnessing the launch of high-end projects as well. Many more such projects are being planned as the metro construction is expected to finish by end of 2018. The transit route will be a major boost to the area and resolve existing connectivity issues to a large extent. Varthur is another location attracting mid-segment buyers in large numbers. Along with Sarjapur Road, Varthur offers proximity to the key office areas in Whitefield, Electronic City and Koramangala. Being a part of the Outer Ring Road, these two areas have benefited significantly from the growth of IT corridors along this important route. Coupled with the affordable prices in most residential projects, both these locations will remain a hit with end-users and investors. Hyderabad’s Gachibowli area has emerged as a destination with a reputation of having all that a home buyer can ask for – suitable property prices, proximity to DLF Cyber City – Hyderabad’s first IT SEZ – as well as HITEC city, and well-developed physical and social infrastructure. Gachibowli also has good access to the airport via Outer Ring Road. There are obviously a number of other destinations across India’s vast geography that are drawing the interest of investors today – these hotspots highlight what is working best in only four of the major cities. A basic premise of successful residential property investment in India is that areas which are emerging – in other words, in the earlier stages of development – can yield better returns to established corridors, where price growth potential may have saturated. Established micro-markets will sooner or later ‘peak out’ when it comes to capital value appreciation. Once this peak is reached, the rate of growth will either reduce or stagnate. Needless to say, this kind of scenario is not optimal from a property investment perspective – which, in India, tends to revolve largely around capital price growth. For residential property to reap good capital appreciation, the entry point must be suitably low even as the potential for future growth in a reasonable period of time remains promising.